The Newest Rant: I'm Excited for the STL Comics Winter 1 Day on Sunday! I'm Excited for the STL Comics Winter 1 Day on Sunday! If you were to walk up to me and ask, "Hey David, what's your favorite comic-con?" I would first say, "Who are you and what are you doing in my driveway?" and then say, "Well, that's a simple question with a complex answer." You see, I love the Toyman show which is a bit more toy-focused and does have comics, but it isn't officially a comic-con per-se however, it is more of a awesome and occasional show, so it can't be included in that question. Also, when it comes to my favorite show that happens once a year I adore the Saint Louis Comic-Con that occurs in June too. My favorite show that happens twice a year and where I actually end up doing the most buying of comics every time however? 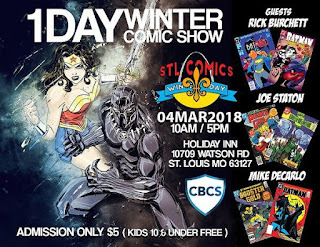 That is without a doubt both the Winter 1 Day and Summer 1 Day put on by STL Comics. I think I get the most purchases done at the STL Comics cons because they manage to cram so many vendors of awesome merchandise into their events. STL Comics is a fully comic (and toy)-focused show that is proud of how unlike some cons out there you won't find yourself harassed by people trying to sell you Lasik surgery (I enjoyed Wizard World this year, but those people were pushy). It also is fantastic because the entry fee is an inexpensive 5 dollars (kids 10 and under are free) and parking is free--so you can focus your funds towards all the rad comics and toys! The Winter 1 Day this year will have such special guests as Joe Staton, Mike DeCarlo and Rick Burchett plus more, and a ton of fantastic comics and toys for sale--seriously, I cannot emphasize enough how much good stuff I always find at the STL Comics shows. It is this upcoming Sunday, March 4th, and goes from 10AM-5PM at the Holiday Inn located at 10709 Watson Road, Saint Louis, MO, 63127. I plan to be there and hope you will be too!